Pizza is often thought of as an Italian food. And, why not? It comes from Naples and traditionally includes a tomato sauce base with cheese and herbs packed with any toppings hungry chefs enjoy. But the reality is, pizza can come in a variety of colors, flavors and even be inspired from different cultures. The Ancient Greeks covered their bread with oils, herbs and cheese. The Romans created placenta, which is a sheet of flour topped with cheese and honey and flavored with bay leaves. Pizza how we know it originated in Italy as the Neapolitan pie with tomato. Cheese was added in 1889. Rumor has it, King Ferdinand I would dress as a commoner to gain access to pizza, which the queen had banned from the royal court. In 1889, Queen Margherita of Savory was served pizza while visiting Naples. It was created to look like the Italian flag with tomato for red, mozzarella for white and basil for green. The pizza is now named for the queen. Even in America we have different styles. New Yorkers, for example, like a thin crust while Chicago is famous for deep dish. Tip: Substitute soy cheese to make this a vegan dish or gluten-free dough for a gluten-free pizza. 1. Preheat oven to 475 degrees. Divide pizza dough into two separate pieces, each roughly the size of your fist. Roll each crust out into a rough circle about 8 inches wide. 2. Place crusts onto a sheet pan drizzled with olive oil. Brush crust with olive oil, then sprinkle with crushed sea salt. 3. Spoon an even amount of chopped chipotles in adobo sauce on each crust and spread evenly. 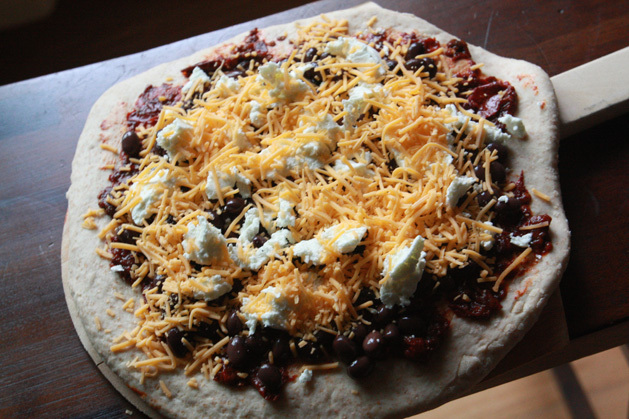 Top with the black beans and goat cheese. Sprinkle with cheddar cheese. 4. Bake for 15 to 17 minutes, or until crust is golden brown and cheese is bubbly. 5. Remove from the oven and top with salsa, sour cream, and sliced avocado, if desired. Serve immediately.